Iceland photographers Johnathan Esper and Iurie Belegurschi are co-leading three winter photography workshops in Iceland over the 2014-15 winter season. 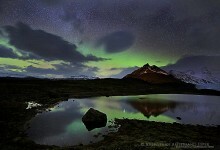 The focus of the workshops will be ice and night sky photography. * 14-21 November 2014 12 of 12 spaces booked! * 24 Nov - 1 December 2014 12 of 12 spaces booked! * 16-23 December 2014 12 of 12 spaces booked! Aurora Hunting: We search and wait for the northern lights, and help you take amazing photos of the aurora displays, with careful attention to strong foregrounds. Their name is derived from Aurora, who was in Roman Mythology, the goddess of dawn, and Boreas, the Greek name for north wind. Northern Lights are visible in Iceland, weather and solar activity permitting, from September to April. Ice Caves: Ice caves of Iceland are unique in the world, and change every season. Our group does a trip to the Ice Caves with a local guide – The faceted crystal blue chambers of ice are always changing and forming, under centuries old glaciers. They are one of the most amazing natural phenomenoms I have ever photographed, and make for some out-of-this-world images. Jökulsarlon glacier lagoon and iceberg beach: We will visit Jökulsarlon glacier lagoon several times during our workshop. The lagoon is filled with massive icebergs in different shapes and sizes, and we often see seals swiming in there also. The black-sand beach at Jokulsarlon is often littered thousands of beautiful glacial icebergs, and are always one of photographers' favorite locations. Winter mornings can offer better opportunities to catch sunrise and the first rays of sun behind the glacial ice chunks, than in the summer months. Our bus will pick us up from the hotel in the early morning, and we will start our journey east. On the way, we will shoot some of the south coast’s most iconic waterfalls,black sand beaches and amazing coast line. Overnight in Vik. Vatnajokull National park is full of exciting photo opportunities of all sorts of ice (this is Iceland after all!) . Glaciers, Ice caves, black beaches with icebergs and much more. We will be as flexible as possible and plan our destinations according to the weather. The main shooting sites are the Glacier Lagoon, the beach next to it and other places of interest in the park. On one of the days, we will take an expert guide to take us to a hidden ice cave.Overnight near Jokulsarlon Glacier Lagoon. We wil spend the day at Skaftafell, where wonderful glacial landscapes await. Later, we will shoot the sunset at the famous volcanic beach of Vik. Overnight in Vik. We will spend the last day of shooting in the famous Golden Circle, including the mighty waterfall of Gullfoss, Thingvellir national park, and the well-known Geysir, are all on our plan. Overnight in Reykjavik (included). End of trip. Registration deposit: 490€ / 680$ Payment in Full: 60 days prior to the workshop starting date. Discounts: Sign up with a group of 3 or more friends and receive a 150 €/200$ discount each ! 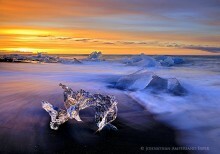 For more information on these workshops and to book, please visit the seperate website iceland-photo-tours.com. Johnathan Esper, one trip leader and owner of this website, Icelandphotography.com, will be happy to answer trip-related questions for you. However, all payment procedures and policies for these trips, as seen above, are based on iceland-photo-tours.com, owned by Iurie Belegurschi.